Hello there, a little while ago I signed up for the Online Card Classes Watercolor for Card Makers Intermediate Techniques class. Well, I finally got around to doing some of my homework! If you follow me on Instagram you will have seen how this piece took shape. I started off with a piece of Arches Cold Press watercolour paper and added this to a board with painters tape. 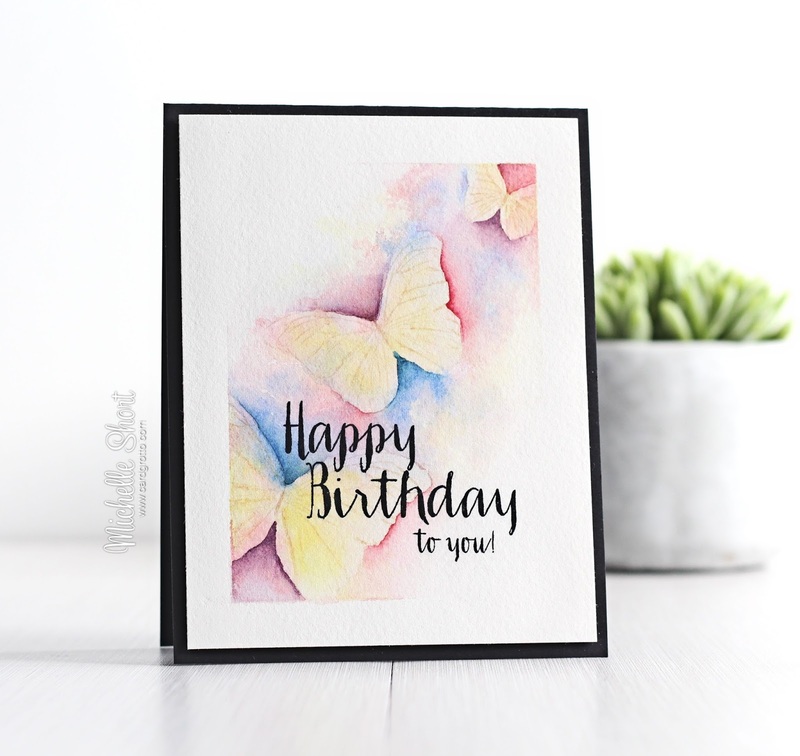 I then stamped the butterflies from the WPlus9 Flora & Fauna set using MFT Natural Hybrid ink. I then went to work water colouring it. I used primary colours of Winsor & Newton tube watercolours. I started off by laying down a wash of colour and then went in to add more definition. Once the piece was dry, I stamped the sentiment from the WPlus9 Strictly Sentiments 5 stamp set, using black ink. I then mounted the piece to an A2 black card base using foam sheet. I really enjoyed painting this piece and I am looking forward to creating some cards like this in the future. Thanks so much for visiting me today. I hope you have a great week! Beautiful! I watched that class in awe. Not tried it yet but you rocked it! Stunning card Michelle! 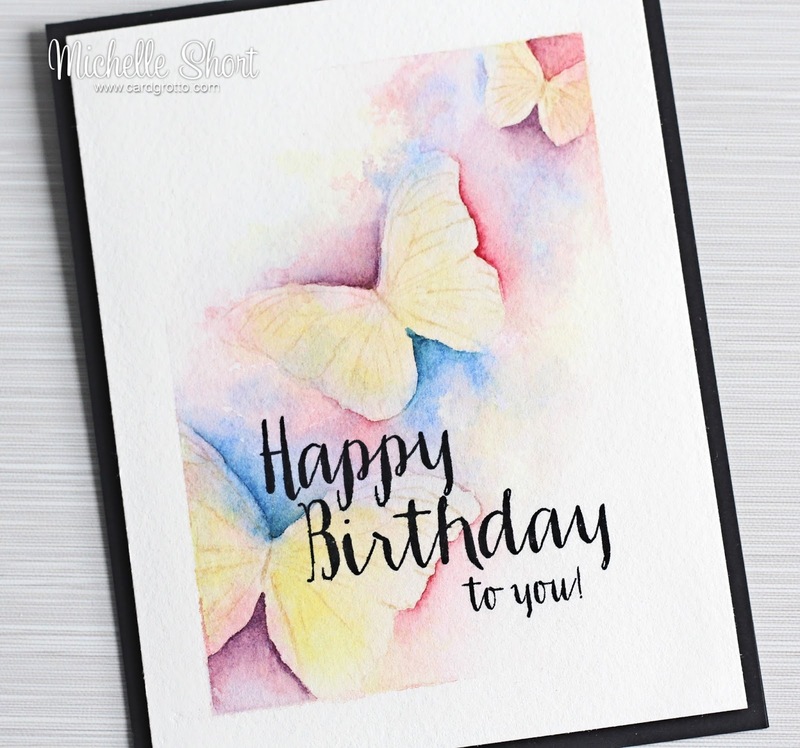 Love the soft tones and the butterflies...WOW! Never thought to use the butterflies! Love this, must try it out myself! Lovely card, Michelle! Your watercoloring is so beautiful. Absolutely stunning, Michelle. As others have said, worthy of a frame! Terrific!! So stunningly colored - awesome!